We are all different. But, after so many broken relationships, you are probably left wondering if you are truly meant to be alone. You believe that it’s not worth all the pain to try and find real love. In fact, you have given up on romance. These signs prove you are that person – someone who believes they are meant to be alone. After everything you’ve been through, you are simply not ready to compromise. In fact, compromising doesn’t come naturally to you, ever. But, if you act that way with everyone, it will make it difficult for you to stay in a relationship. That is why you believe you are simply meant to be single. You would rather spend some time alone than with other people. It is not about your finances or belongings, but it is all about your free time. 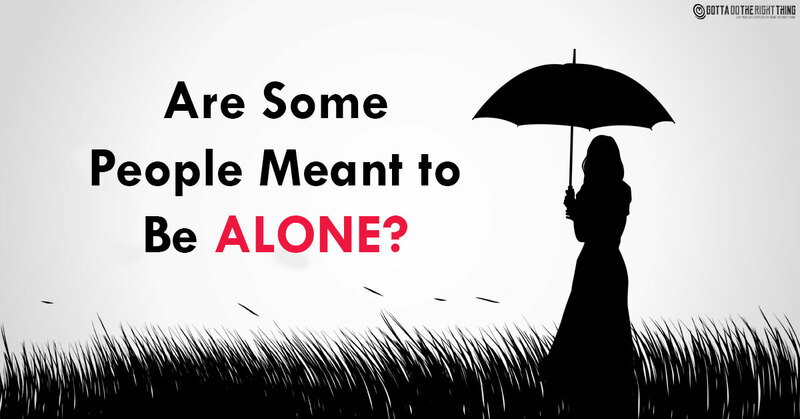 You simply enjoy being alone, so you are ok with not having a partner. When you don’t want to deal with your problems, you usually avoid people since they irritate you. So, you decide to be single instead of sharing your issues. When you decide to be with someone, you share your stories and problems, but that means giving up on yourself. That is why you hate depending on someone else and asking for support. But, if you want to have a partner, you should start caring about their problems once in a while. You don’t need anyone. You are independent and can take care of yourself. But, if you want to engage in a successful and lasting relationship, you will need someone. Someone who will be there for you and you for them. If you don’t learn to live with that person, the relationship will crumble. If you never surrender, your relationship will not be stable. Love is not about war. Love is supposed to be fair and peaceful. So, try to compromise if you are looking for a relationship. Otherwise, your complete lack of empathy will drive other people away. If you want to be in charge of the relationship to be happy, you are better off alone. But, if you want to be in a lasting relationship, it is best to throw the ‘’controlling ‘’ part away and focus on a team effort to get through the day. If you are someone who hates spending time with people, it is better to try and recharge your energy by spending time alone. To be happy, do the things that make you comfortable and happy. Even if you are not a social creature, it doesn’t mean that you are heartless. If you are someone who loves controlling the people around you, even your partner, your relationship will surely crumble. Living with a controlling person is difficult. So, when the day comes, your partner will probably leave you. The hardest thing to learn is that it’s not better to be right than happy. If you want to find someone, it is best that you stop going for the win. Instead of proving that you are right, try to engage in meaningful conversations. If you can’t do that, you should probably give up on finding someone who will want to argue with you all the time. You are an incredibly independent person. Of course, that is not a bad thing. Being a strong and independent person will get you far in life. But, if you want to be a part of a group, you have to learn to work with the team and cooperate.